David Matthews’s music is full of paradoxes - all of them positive. Its expressive manner and intellectual matter seem easy enough to grasp at first hearing, but the openness is deceptive. There’s plenty more beneath the surface that awaits discovery on repeated hearings. The bassoon solo, rising through hazy string figures, that begins the Second Symphony wears no ironic mask, pulls no destabilising tricks to convince us of its modernity - it clearly comes from the heart. Yet there’s no sense of living in the past either. In the Sixth Symphony it’s easy to make out transformed echoes of Vaughan Williams’s hymn tune Down Ampney (‘Come down, O Love Divine’), the melody’s appearance at the end recalling what Vaughan Williams himself called ‘variations in search of a theme’. But Matthews makes the process entirely his own, while the loveliness of the final transfiguration and coda could even be seen as a kind of timely protest – a quiet refusal to play ball in any culture for which, as the artist Grayson Perry puts it, beauty is ‘the elephant in the room’. The performances are wonderfully warm and insightful. 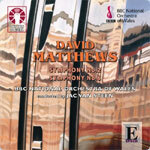 You can't stop David Matthews writing symphonies... and please don't try. Both symphonies here... reveal his lively Englishness and bright ear for colour. The glorious Sixth, grounded in a Vaughan Williams hymn tune, also shows a flair for large structures. Jac van Steen and the BBC National Orchestra of Wales give persuasive performances; the Second's journey from innocence to experience is especially thrilling.